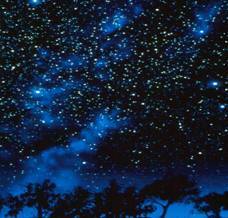 Have you ever looked up at the night sky, from a city, and wondered why it is so hard to see so many stars? Have you ever noticed that the view seems to get better the farther you move away from the city? Have you ever seen, when you are out in the country, a dome of light over a city in the distance? If you have, you've been observing light pollution. 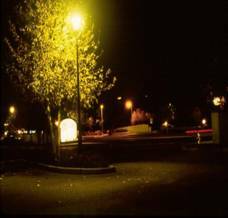 Light pollution is caused by outdoor lighting that is poorly designed and aimed that it ends up illuminating a neighbouring property, the upper floors of a building and the sky ... along with the streets and walkways where we really need effective outdoor lighting. It's an unfortunately byproduct of our insatiable need to turn the night into day. But, it doesn't have to be this way. We can still have our security and preserve the night skies. Here we see the standard views of the night sky in the heart of the city, from the suburbs and beyond. Why are we lighting up the sky so much? The biggest reason is that government, business and industry have no idea how much energy they are wasting! Take a good look at this picture of the eastern US and Canada . 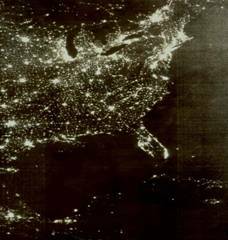 It was taken by NASA and shows just how much light is being needlessly sent upwards where it is not needed. 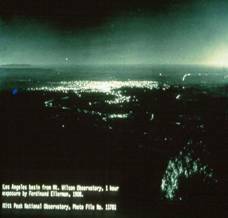 These two images show how light pollution has grown over the past century. They are both of the same area -- the Los Angeles Basin taken from the Mount Wilson Observatory. The photo on the left is from 1908 ... the one on the right was taken in 1988. 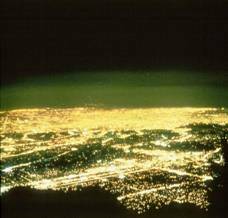 Light pollution has grown by that much in Los Angeles ! 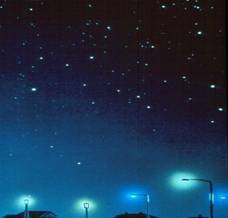 How much has light pollution grown in your locality? Are You Safe and Secure at Night? 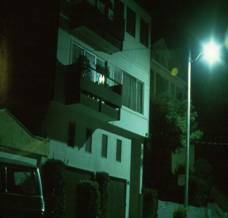 At which of these houses would you feel safer walking at night -- the one on the left or the one on the right? 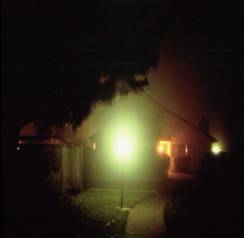 The house on the left has the same type of security lighting that most homes and businesses have. YOu can actually see how a mugger could hide in the shadows, waiting for you to walk by. You'd actually be safer if you would just turn the darn light off! The house on the right, however, is using full cut-off light fixtures. These send all of their light down to the ground, eliminating blind spots and shadows. As well, they can save you money because they require light bulbs of less wattage! Better lighting at a reduced cost .. what a concept. 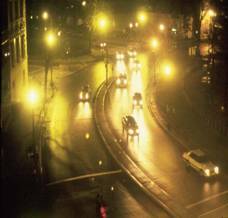 These street lights are standard in most areas -- much of the light they produce is wasted ... the streets still have dark areas and the glare is dangerous to drivers. Take a look at these three images and ask yourself if they are doing a good job illuminating the surrounding area. Actually, these lights are doing far more harm than good. Two of them are lighting up the trees and lawns more than any of the walkways where the light is actually needed. The third one seems to be sending more light into the apartment beside it! What happens to be the birds or other animals that are trying to sleep in the trees? What about the trees themselves? Are they prematurely aging? All life on the Earth -- including all flora and fauna as well as mankind -- needs a clear distinction between day and night or their biorhythms will be upset. In the case of animals like squirrels, skunks and raccoons, this can be a leading cause of them becoming pests. A whole new science, called Scotobiology is looking into the effect that artificial outdoor lighting has on nature. 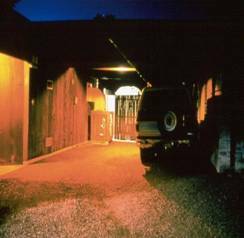 Cutting back on unnecessary outdoor lighting will go a long way to re-establishing the delicate balance between our need to be safe and sound while outside at night ... and the best interests of Mother Nature. 1. 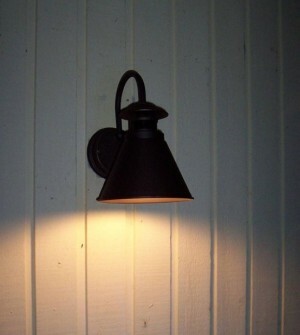 The most important thing you can do is to change your own outdoor lighting to utilize full cut-off fixtures. You can also use fluorescent bulbs and timers or motion sensors wherever possible. When choosing an outdoor fixture, look for a logo on the box and/or a tag that notes that the fixture is recommended by the International Dark Sky Association. This logo ensures that you are buying a full cut-off fixture. Here's a good example of a full cut-off light fixture for your home. Home Depot outlets in Ontario have several models of this kind of fixture. All of the light shines down to the ground where it is needed the most! 2. If your local lighting stores do not stock full cut-off fixtures, ask them to start ordering them. Fill them in on the benefits of this type of lighting. 3. Tell your neighbors what you are doing and why. 4. 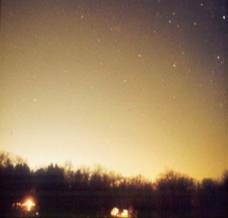 Become active and ask your local elected officials to get on board by adopting light pollution abatement laws. 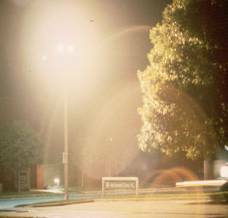 Ask them to start replacing their streetlights with full cut-off fixtures. Encourage them to save wasted tax dollars! 5. If you have a local astronomy club, contact them for more information. They can make a presentation on the topic to your own group or club. If they can't, they should be able to put you in touch with someone who can. 6. Become a member of the International Dark Sky Association. 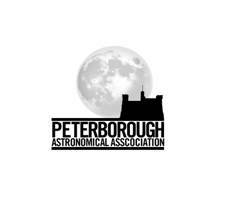 The Light Pollution Awareness Committee of the Peterborough Astronomical Association has speakers with audio-video presentations available for schools, service clubs, community groups, municipal councils and other astronomy clubs. Contact our Chairperson for assistance. "This idea began because you and your group took the time to raise it. Thank you for doing so. I think we can make our community a better one through this." 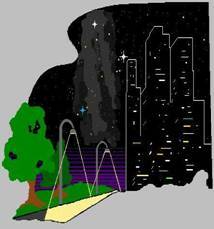 You can do your part by taking up the fight for light pollution abatement! All Images used are courtesy of the International Dark Sky Association and the Peterborough Astronomical Association.